The American Nightmare: The History of "Dark Captain America"
Image from Captain America vol. 7, issue #1 by John Romita Jr. When Captain America Comics #1 was released in December of 1940, America had not yet entered World War II, but patriotism and jingoism were part of the zeitgeist of America. Cap wasn’t the first patriotic superhero — he was preceded by the Shield of MLJ Comics (who would later become Archie Comics) and Cap was similar enough so that they had to change his original shield from a wedge shape to a circle. As created by Joe Simon and Jack Kirby, Captain America was not just a patriotic superhero: he was also the embodiment of the American Dream. However, America, for all its greatness, has also been filled with darkness, racism, prejudice, and, yes, a touch of fascism. And while Captain America may represent the idealized American Dream, there have been plenty of “dark” Captain Americas that represent the American Nightmare. Beware: spoilers for the first issue of Captain America: Steve Rogers. Image from Captain America Comics #6, by Joe Simon and Jack Kirby. First off, let’s be clear: the Golden Age Captain America comics made by Simon and Kirby were a breakthrough, yes. They showed Cap punching Hitler in the face before the US even entered the war and Simon and Kirby received death threats because of this. The US was isolationist at the time and the German-American Bund was a powerful group. However, that doesn’t mean the comics were all good. Much like Superman comics at the time (and many other Golden Age comics), when Captain America encountered Japanese forces, they were always portrayed as racist caricatures. While the Captain America of today is not racist, the Captain America of the 1940s was definitely racist against the Japanese. Image from Young Allies #8. While Captain America Comics included a few stories that had racist depictions of the Japanese, the spin-off book Young Allies was even worse: they not only had several stories with racist depictions of the Japanese, but one of the main characters was the incredibly racist African-American character of “Whitewash Jones.” To quote the Marvel wiki, the character was “a dimwitted, racial stereotype that was modeled after a minstrel show.” The portrayal was so bad that the entire Young Allies book was later retconned into being fake, released as propaganda, with the real version of Washington Carver Jones being nothing at all like what was represented in the comics. And honestly, that is what Captain America Comics were: patriotic, jingoistic propaganda. After the superhero fad of the 1940s faded, Timely Comics tried once to bring Captain America back in the ‘50s. However, the Nazis had been defeated, so who was Cap supposed to fight? Well, who else except the Communists. For three issues of Captain America and a few more issues of Young Men, Captain America and Bucky fought against Communist agents from Russia and China. And no, the depictions of the Chinese were no less racist than the depictions of the Japanese had previously been. This “Commie Smasher” Cap wasn’t a success, it was cancelled again and Steve Rogers didn’t come back until Avengers #4 in 1964 when it was revealed that he was actually frozen in ice at the end of the war. So who were the ‘50s Cap and Bucky? At the time, Stan Lee had simply forgotten about the ‘50s adventures of Cap and Bucky, so they were thought to simply be non-canonical. However, in the 1970s, writer Steve Englehart brought back the ‘50s Captain America...as a villain. In fact, Englehart’s first issue as writer was Captain America #153, where the Commie Smasher Cap and Bucky were revealed to be William Burnside and Jack Monroe, who had taken a version of the super soldier serum that was now causing them to lose their grip on reality and see “Communists” everywhere. Englehart knew how the American Dream could be twisted — the return of Commie Smasher Cap was a direct commentary on the Red Scare of the ‘50s and ‘60s, the paranoia of seeing Communism everywhere. The American Dream becoming the American Nightmare. Englehart then had Doctor Faustus brainwash Burnside, twisting the American Dream even more until this Captain America became the Grand Director for the National Force, a neo-Nazi organization. In end of that story, the Grand Director kills himself instead of being captured by Captain America. Burnside wasn’t dead, however: during Ed Brubaker’s historic run on Captain America, the 1950s Captain America returned to avenge the death of his former partner, Jack Monroe, who was killed by the Winter Soldier, the real Bucky Barnes. Burnside was being manipulated by Doctor Faustus again, but this time he was able to escape. What ensued was another look at the dark side of the American Dream: a storyline called “Two Americas,” where Burnside, having become a “man out of time,” decided he didn’t like what the country had become and that what was needed was for him to overthrow the government and start a new one. To this end, he became the head of the Watchdogs, a group of racist militiamen. At the end of the storyline, Burnside reverted back to his original Captain America costume and forced Bucky to wear his own original costume, all the while trying to destroy the Hoover Dam in a symbolic attack on present day America. Declaring that he would never stop until the “corrupt government” was overthrown, Bucky was forced to shoot him. Burnside wasn’t the last dark version of Captain America. The next one appeared in Mark Gruenwald’s epic run: John Walker first appeared in Captain America #323 as the “Super-Patriot,” a right-wing, conservative superhero, who went around and tried to discredit Captain America. He was backed up by the “Bold Urban Commandies” or BUCkies, who staged attacks and attacked those who opposed their conservative values. Eventually, Walker gave up on the Super-Patriot identity and took on the title of Captain America after the Commission on Superhuman Activities tried to force Steve Rogers to work for them and he quit instead (Steve went on to call himself “the Captain” during this era). As Captain America, Walker wasn’t as averse to killing people and when members of his own team (called “Left-Winger” and “Right-Winger”) informed the public about who Walker was and the Watchdogs killed his parents, Walker not only killed the Watchdogs in revenge, he burned “Left-Winger” and “Right-Winger” alive, leaving them in comas. 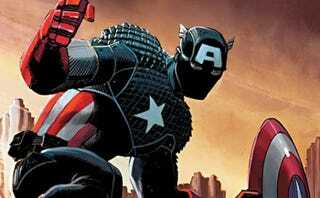 After it was revealed that the Red Skull had influenced the Commission on Superhuman Activities, Walker himself was fired as Captain America and then later became the hero U.S. Agent. As U.S. Agent, however, he was barely better than he was as Super-Patriot, still jingoistic to the point of parody. If you thought America looked bad in the ‘70s, you hadn’t yet experienced the ‘80s yet. This is when the true dark shadow of Captain America was revealed in Daredevil #232: Frank Simpson or “Nuke,” a deranged super-soldier who got hopped up on red, white, and blue pills in order to shoot down people in Nicaragua. Nuke was Frank Miller’s direct commentary on the American Nightmare: in the story, the tail end of the epic “Born Again” saga, Wilson Fisk meets with Frank Simpson and tells him all about the American Dream and how Fisk himself is the embodiment of the American Dream (a.k.a. capitalism and greed), only opposed by the Devil himself. The MCU version is named Will Simpson (played by Wil Traval) and he appears in Jessica Jones, but he is still the dark mirror version of Captain America. This is shown by the fact that not only is Will a former soldier, but he also wears the same aviator sunglasses and leather jacket as Steve Rogers does while undercover. However, unlike Steve, Will lets his need to protect others and avenge his own brainwashing consume him until he goes back into the super-soldier program (with the same red, white, and blue pills) and then goes into a killing frenzy. He is the embodiment of toxic masculinity, the need to be the Alpha Male. The American Nightmare of the 21st century, the Dark Captain America. Which brings us to the current day and the twist ending of Captain America: Steve Rogers #1: that the original Captain America, Steven Rogers, is and has always been Hydra. On the face of this, it doesn’t make any sense. He has had plenty of opportunities in the past decades to help Hydra and we’ve never seen him do it once (aside from the times he was brainwashed). So why reveal himself now? There are plenty of in-story reasons you can find (my personal opinion being memory manipulation), but the out-of-story reason is, of course, because the American Dream is not as good as we once thought. In the 1940s, before America entered the war, there were protests about government overreach (the “New Deal” of Roosevelt) and even people rejecting Jewish refugees from war-torn Europe. Look at how much has changed in 75 years. Captain America has always represented the dream of America, because the reality has almost always been unfair, unequal, and depressing. Back in 1940, Americans needed someone to inspire them to fight the war for the right reasons, which Captain America did. In 2016, however, we end up fighting wars for the wrong reasons and creating new wars and new enemies while we’re at it. “Ice” was all about how Captain America being accidentally frozen in ice was faked by the US government and instead, it was the government who kept him in suspended animation. It was only through the intervention of Namor that Captain America escaped from suspended animation...and found himself again frozen in ice just in time for the Avengers to find him. And the reason the government froze Cap? It was because he would have been against the dropping of the Atomic Bomb on Hiroshima and Nagasaki. Austen (no matter how good or bad the story was) was clearly writing from a post-9/11 perspective, a perspective that mistrusted the government. He was writing about the American Nightmare, a dark twisted version of the American Dream. “Ice” was a strange, strange story that changed everything that was known about Captain America. Image from Captain America vol. 4 by Jae Lee. Except, of course, it didn’t. The story was quickly forgotten about and when Ed Brubaker began his run on Captain America, he definitively showed that Cap was buried in the ice accidentally. Captain America is Hydra. Except, of course, he’s not the only Captain America. In fact, there are two other Captain Americas out there: Sam Wilson, former social worker and formerly known as the Falcon, and Roberta Mendez, the Captain America of 2099, who was now stuck in the present day. As well, there are three other characters now associated with America: Ms. America Chavez, Danielle Cage, the Captain America of 20xx, and Samantha Wilson, the Captain America of Spider-Gwen’s Earth. Notice anything similar? None of them are white men. Sam and Samantha are African-American, Roberta and America are Hispanic women, and Danielle is a biracial woman (her father is Luke Cage and her mother is Jessica Jones). If Steve represented the old American Dream, they then represented the new American Dream. This isn’t an American Dream that’s still racist against the Japanese and the Chinese. This isn’t an American Dream that holds nostalgia for the “old” America and it’s conservative values. This is an American Dream that embraces everyone. So where does that leave old Steve Rogers? He was someone who never compromised, someone who held fast to the American Dream, even as it gave up on him. He witnessed the downfall of a President, became a Man Without a Country, and more. So how do we reconcile that man with someone who has been a Hydra agent all along? By realizing that this is simply a metaphor, by seeing that this is a twisting vision of what Captain America represented: the real America of the past, the country that was on the edge of fascism, pushing away Jewish refugees as it imprisoned Japanese-Americans. Sure, you can say that this isn’t the real Captain America. There is no real Captain America. He is merely a fictional character. It’s what he represents that we hoped was real and it’s now what Sam Wilson and the others represent that we hope is real: the new American Dream.